This one’s a favourite. Easily accessible, suitable for all ages and fitness levels, and educational as well! The trail starts Willingdon Beach campground, and follows the coast north for 1.2km along an old 1910 rail bed that was once used to carry logs to the dumping wharf at the Powell River Company Mill. The trail is flat, wide, and accessible to all. The trail has interpretive signs that teach users about local history, flora and fauna. 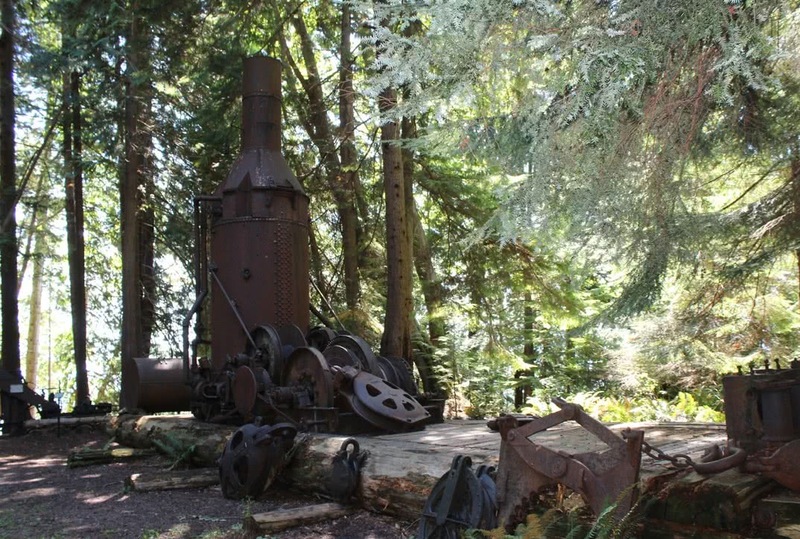 It also explains the usage and usefulness of long retired logging equipment, which is displayed beneath old growth firs, cedars, spruce and maples at the edge of the sea. When the official hiking trail ends it is easy to continue your exploration through a connected network of trails that lead into the heart of Powell River’s historic Townsite district. Or you can stick to the coast and continue to beachcomb your way down to sandy Second Beach. Be sure to catch a view of the ‘hulks’, a breakwater of concrete ships that served in both world wars! If you’re looking for more elevation, and a great view of Powell River, head to Valentine Mountain. This hiking trail is located behind the cemetery in the Cranberry district. This is another short trail that climbs slowly but steadily to the foot of Cranberry Mountain. After the last steep climb to the summit you are immediately greeted with an incredible view over the historic Townsite. The still-functioning paper mill, the Strait of Georgia, and the mountains of Vancouver Island lie beyond. Look south and your gaze follows the bend of the coast to the main residential district of Westview. The ferries to Vancouver and Texada Islands are seen coming and going along their route. The peak is a great place to rest and eat lunch, but further exploration of the summit leads down winding trails to viewpoints that showcase the emerald blue of Powell Lake and the Shingle Mill restaurant, as well as the Coast Mountains to the east. These are a network of hiking trails that begin in and around the Duck Lake area. They are accessed up Haslam Road in Cranberry. Turn left when you reach the junction at the edge of the lake and well-marked trail heads start appearing with small pullouts for vehicles on both sides of the road as you continue along. This area has over 50km of hiking trails, and something for everyone to explore. 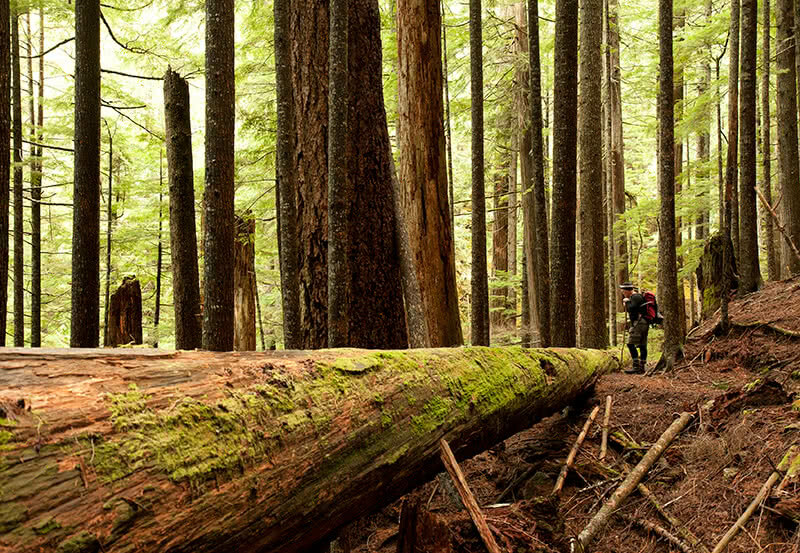 Huge mossy old-growth forests, cascading waterfalls, and handcrafted log bridges spanning salmon bearing streams. All of which are maintained by local volunteers and enjoyed by walkers, runners, bikers, dog walkers and tourists alike! A Personal favourite is the Blackwater Creek trail, which travels through incredible dense mossy forests and culminates in the gorgeous Kelly Falls, the perfect place to enjoy a packed lunch with the soft spray of the waterfall cooling you down after a hot summer hike. This trail begins a couple kilometres south of Lund on the Highway 101. It is a beautiful, easy going hike that takes you to a series of mossy bluffs overlooking the ocean. The reward at the end is a spectacular view of the sandy beaches of Savary Island! The location of this hike​ along the coast of the Malaspina Peninsula means that the scenery and flora encountered is vastly different from the areas more inland hikes. Conditions are drier, and species such as shore pines and arbutus trees thrive in the harsh rocky conditions. The trail can be accessed directly from Dinner Rock campground and is a fantastic day trip without breaking camp. The Atrevida Loop is accessed directly off the inland side of Highway 101 approximately 12 kilometres south of Lund, just north of Atrevida Road. The loop takes about an hour or so to complete and is relatively flat, passing through some strands of ancient firs and cedars. Some of the bigger firs are estimated to be around 1000 years old! From the Atrevida Loop, it is possible to access other trail systems including the Sunshine Coast trail and the Appleton Canyon. Bring your bikes and combine some of these trails to turn a lazy looped hike into an exploratory pedal. The Knuckleheads Recreation Area is at an elevation of between 5300-5500 feet, and is a phenomenal, 4-season paradise. The area is relatively easily access using a series of active forest service roads. Two volunteer built backcountry huts make the area a great place for multi-day hiking, snowshoeing, or ski-touring. The area is mostly used as as a winter wonderland. However, during summer it is very popular with hikers, naturalists, and ATV users on day trips from Powell River. Care should be taken to get reliable directions before you set out (forestry maps are available in town). Please ensure that there is no active logging occurring in the areas you intend to travel ahead of time. 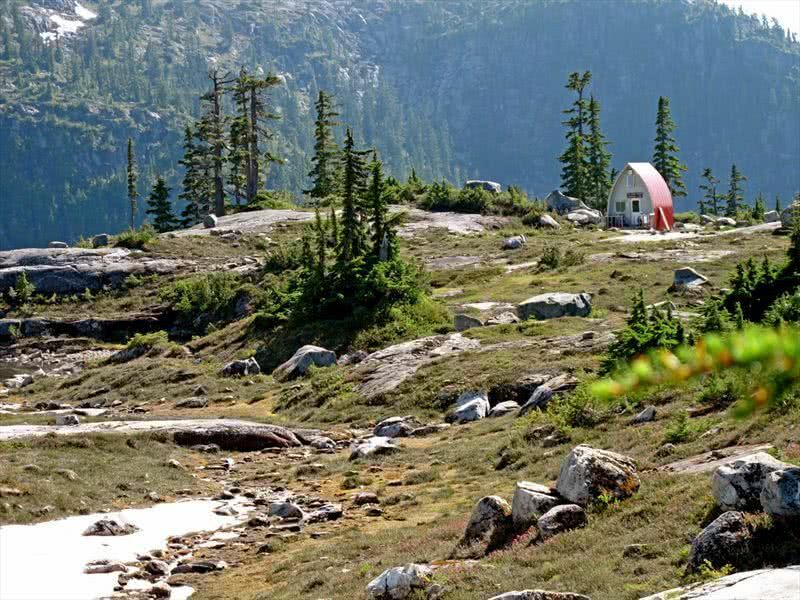 The least accessible – but most rewarding – backcountry hike in the area is up to the alpine hut at Emma Lake. This stunning alpine paradise is nestled in amongst the peaks of the South Powell Divide. Follow Goat Main to 34 Mile and follow the Emma Lake sign to the trailhead. The hike ascends rapidly through a section known as the ‘Stairmaster’ for between 2 and 3 hours. Finally, hikers reach the ridge line that overlooks the lake and descend down to the waiting cabin. Emma lake itself is a gorgeous alpine lake that glistens turquoise and green in the summer sun. Due to its elevation, it often still contains winter ice well into July and August! From the cabin, there are many day hikes along the ridges of the surrounding peaks and the South Powell Divide itself. Many people use the cabin as a base for further exploration of this incredible area. Be sure to bring bug spray though, as they can be very aggressive up there in the summer months! Teams of dedicated, extremely hard-working volunteers have created, enhanced, and maintained the extensive network of trails in and around the Upper Sunshine Coast. Special thanks to the BOMB Squad and PRPAWS, as well as countless unnamed individuals, mountain bikers, climbers and anonymous work crews that have selflessly contributed to these incredible community resources! The best resource for non-SCT hikes in the area is Eagle Walz’s ‘Along the Edge of the Salish Sea‘. This book can be purchased in local bookstores or online here.